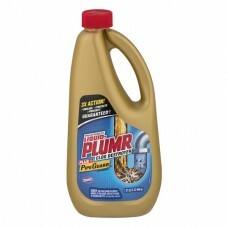 Liquid-Plumr® Pro-Strength Clog Destroyer PipeGuard™. 3x Action! Unclogs, protects, prevents* - guaranteed†! Clog remover. 1 qt (32 fl oz) 946 ml. Product Guide: Clog Destroyer + PipeGuard™: Fully clogged drains. Slow drains. Clog prevention. Hair clogs. Urgent Clear™: Fully clogged drains. Slow drains. Hair clogs. Hair Clog Eliminator: Slow drains. Hair clogs. 70% More actives. Safe for all pipes! Garbage disposal, plastic, metal, septic systems, older pipes! Contains no phosphorus. For more product ingredient information, Visit: www.ingredientsinside.com. Made of global components. *With regular monthly use. †Based on full hair clogs in lab tests. how2recycle.info. Money back guarantee! For Questions or Comments, Call: (800) 227-1860 or Visit: www.liquidplumr.com. © 2017. Pour 16 oz. (1/2 bottle). Wait 15 minutes. Flush with hot water. Repeat regularly to prevent buildup.